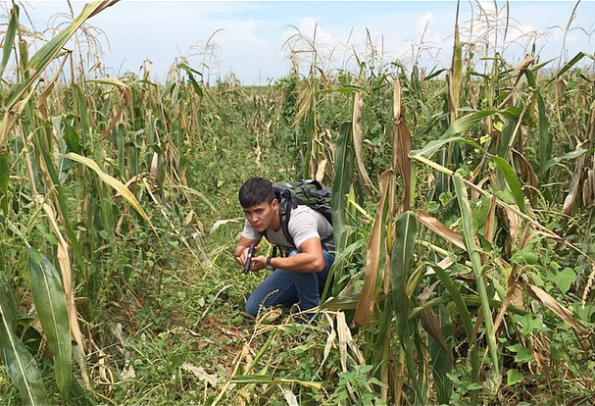 Matteo Guidicelli Shares Photos From His Upcoming Action Movie "Tupang Ligaw"
Actor Matteo Guidicelli wades into unfamiliar waters as filming starts for an action movie that will have him as the lead. The young Filipino-Italian who made his mark in the Philippine entertainment industry through his appearances as a dramatic actor in television shows will debut as an action hero in Tupang Ligaw, an indie flick that will have him handling guns and taking down enemies with force. On his account on the social media site Instagram, Guidicelli posted at least two photos of himself taken during movie shooting. In one, he can be seen crouching alone in a cornfield with a handgun in his hand. The actor also posted short video clips of himself going through gun training and shooting drills. Tupang Ligaw will be directed by Rod Santiago. According to a Star Cinema report, the movie is an advocacy film that is going to support gun ownership while educating the public about the dangers of irresponsible gun ownership. Guidicelli's co-stars on Tupang Ligaw are Paolo Contis, Rico Barrera, Francis Ryan Lim, and Bangs Garcia. Early reports about the movie say that the main plot will involve a man who is a policeman looking for his missing brother. Guidicelli will play the young man while Paolo Contis will play the villain who carries the name El Diablo (The Devil). The lead role in Tupang Ligaw was originally offered to Xian Lim but the actor turned down the role as he is also doing a movie alongside Angel Locsin and Vilma Santos Recto. Source: Matteo Guidicelli via Instagram. Tupang Ligaw is Guidicelli's sixth major movie appearance. His previous projects are Catch Me I'm In Love, My Cactus Heart, Somebody To Love, Moron 5.2: The Transformation, and Shake Rattle And Roll XV. The actor is currently playing Greg Navarro in the television series Inday Bote.